On the last day of the Icelandic Horse Expo tour we woke up to a clear blue sky and sunshine. No one showed any signs of tiredness after the party last night, and after an excellent breakfast some of us enjoyed a cup of coffee on the terrace before embarking the bus for todays drive. While driving through the scenic landscape of the north, our guide Petra was telling us a little about the history of Iceland. For example, many farms have through the centuries kept the same name that they were given by the first Viking settlers in Iceland, over a thousand years ago. You can find the names in the Book of Settlement and the Icelandic sagas, written in the 12:th century. Today we had the great pleasure to visit the Gauksmýri farm. Like many of the other farms we have visited this is a family business, and at Gauksmýri we met Jóhann, his girlfriend Kolla and his daughter Hrund. They do not only breed and train horses, but run both a hotel with an excellent restaurant, a horse rental and are also putting on a horse show every day from the beginning of May until middle of October. The show is set up as an introduction to the Icelandic horse, its special gaits and other characteristics, and is very popular among the many foreigners visiting Iceland. After a very nice lunch we went outside to see the show, performed in all gaits at the oval track just by the restaurant. We got to see three first prize horses ridden, for example the "King of the farm", Karrí frá Gauksmýri. Then we were invited to see the stables, and get a close look at both young horses, stallions and rental horses. A beautiful sunset greeted us when we arrived to Keflavik, with many, manyexperiences, memories, information and pictures to bring home. 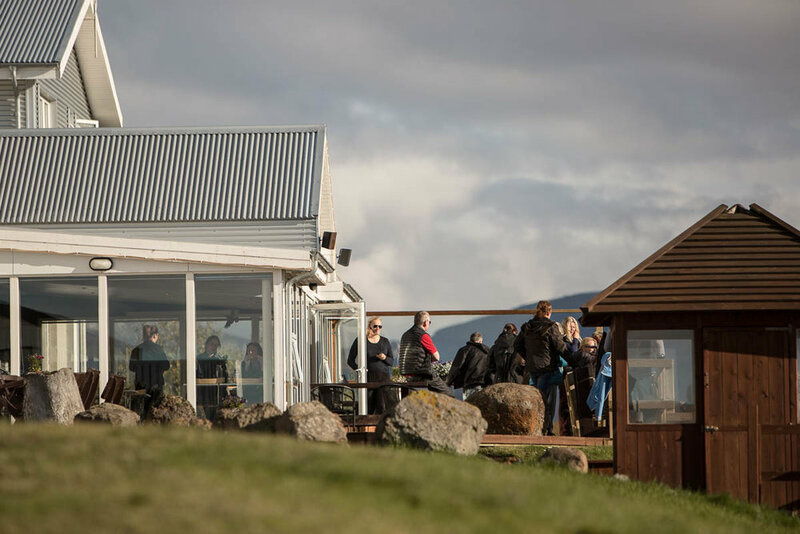 We want to thank everybody for a fantastic week – our guests for visiting us and their endless interest in the Icelandic horse – and the breeders and the Icelandic horsepeople for inviting us and putting so much effort in making the visits an unforgettable experience. Hope to see you all again in Iceland or somewhere else! Older PostDAY 4: THE MAGNIFICIENT LAUFSKÁLARÉTT!